The DCI Hall of Fame Class of 2009. Each year nominations from across the drum corps community are collected for candidates of the most prestigious Drum Corps International honor to be awarded. The DCI Hall of Fame is where the legends of drum corps are remembered for the indelible impressions they have left on the activity and lives of thousands of young musicians and performers. The election by corps directors and current Hall of Fame members occurs each spring as the next class of DCI Hall of Fame members is selected to be honored during the DCI World Championships. Anyone may nominate an individual for consideration through the annual submission process. A Monday, Feb. 15 deadline has been set for all nomination letters. 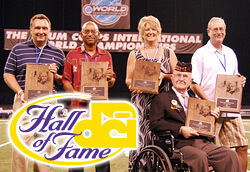 Once determined, members of the 2010 DCI Hall of Fame class will be honored at Lucas Oil Stadium during the 2010 World Championships in Indianapolis, Ind. Learn more about the DCI Hall of Fame nomination process. Learn more about the Hall of Fame Class of 2009. View all members of the DCI Hall of Fame.